Its main aim is to raise awareness of the underutilised potential of women in the sector. 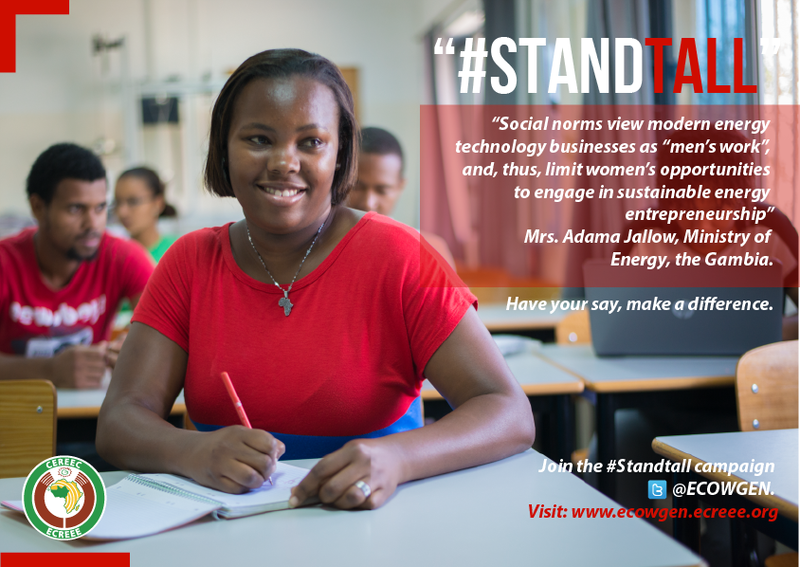 Dubbed #Standtall, the campaign recognises that women are under-represented in energy jobs, particularly in technical areas. A survey conducted in the ECOWAS region revealed that social norms tend to ‘allocate’ jobs to men and women, with men being the preferred gender for jobs related to technology. Jobs related to administration are assigned to women, potentially preventing them from enjoying the same opportunities as men in a dynamic sector that could improve women’s social status and help them influence their communities. Educational achievements reflect the same trends. For instance, fewer women participate in science, technology, engineering and mathematics (STEM) – a critical educational field underpinning energy development. In 2012, just 24%, 15 % and 23% of women graduated in STEM fields in Gambia, Ghana and Liberia respectively. In the first phase of the campaign, a writing competition targeting young men and women aged 16-32 kicked off the campaign in March/April 2015. The top three finalists from over 20 entries Etido Elijah, Chinonso Onah and Anna Umegboro were awarded USD 500, USD 300 and USD 200 as first, second and third prize respectively. A series of awareness-raising and sensitisation activities and events were also held to build public support and mobilise action for change. They attracted more than 100 people from 35 countries globally including ministers and high-level officials from government organisations, development partners, non-governmental organisations, civil society organisations, academia and the private sector. A video on the campaign can be found here. The next phase of the campaign means soliciting practical action from organisations that overcome gender inequality in the energy sector. More information on the campaign’s dedicated page by clicking here.